Don't Get Caught With Your Plants Down! No money down for our interior plant service! Plants, delivery, and installation at NO CHARGE! A small monthly fee includes weekly service and guaranteed free replacements. If you already have Miami plants, it is no problem. 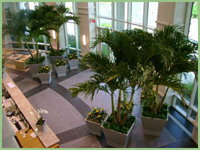 We will service your indoor office plants and provide free replacement. Choose from a wide variety of the best plants for the best price. We guarantee to give you the best service for the best price. No other company beats our service or prices! Free replacements are provided when the plants appearance deteriorates of becomes unhealthy. Beautiful Orchid Arrangements delivered to your property with weekly maintenance and free replacements. Many colors to choose from. Applying professional methods, from trimming, cleaning, dusting, to the dress code for our technicians. We work hard to keep your plants looking their best always. Your plants are a representation of us and you! Our service includes replacing the plant free of charge when it becomes unhealthy or the appearance deteriorates. Our technicians provide replacements promptly. No need for you to even request it. They are automatically replaced when necessary. Interior plant service in Ft. Lauderdale and Miami!!! Weekly watering - Our technician checks your plants on a weekly basis, determining the amount of water your plants need according to their environment or condition. Trimming – Weekly your plants are trimmed and pruned. Bad leaves are removed and the browned parts are trimmed. Plants are trimmed as needed to keep their healthy appearance. Dusting and Cleaning - All the plants are dusted and cleaned on a weekly basis. Facing – Each plant has a face that shows the plant at its best. This is also done weekly. Call one of our South Florida locations for a free consultation!